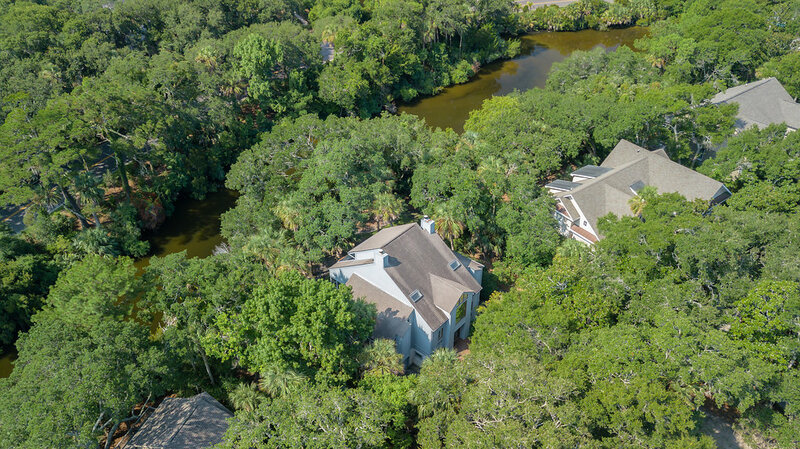 This Kiawah Island vacation rental, located at 5 Bufflehead Drive, has 5 bedrooms, each with its own bathroom, a gorgeous pond view, large screened porch and is just a 7-minute walk or quick bike ride to Kiawah’s pristine beach. Enter the main level and enjoy the fully equipped, updated kitchen featuring marble counter tops, stainless steel appliances, shiplap accents, and a center island that seats 3. The main living area has plenty of comfortable seating with a sofa, love seat, and 2 chairs. It also features a mounted flat screen TV perfect for catching a break from the sun. The dining area, with 8 chairs, is a great place for enjoying a family meal together on vacation. 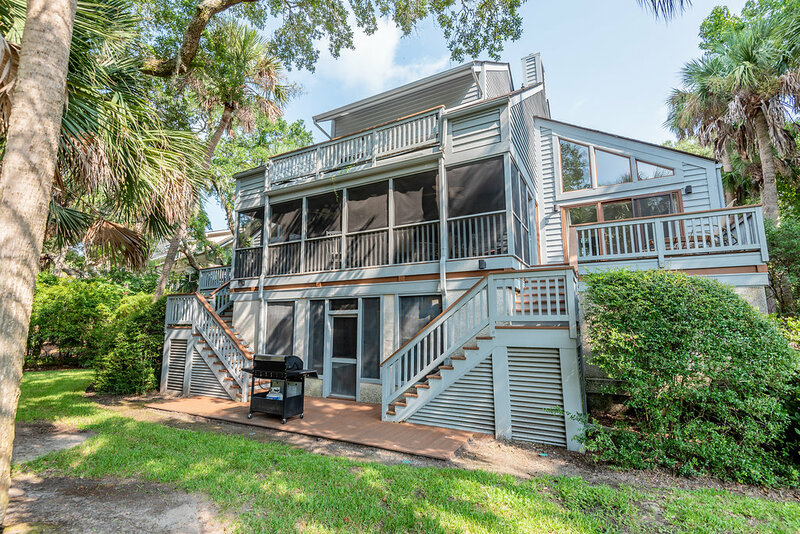 Walk out to the large screened porch and see several chairs for lounging and a table and chairs that seats 4. 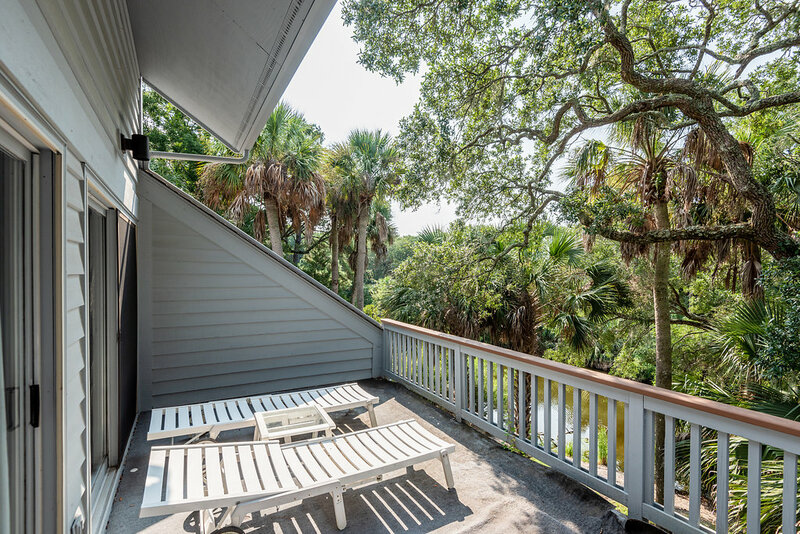 The screened porch is the perfect place for enjoying the breeze, watching wildlife, and enjoying morning coffee or an evening cocktail. Also, on the main level are dual master suites each with king sized beds, private decks, and ensuite bathrooms featuring his and her sinks, jacuzzi tub, and walk-in shower. Completing the main level is a third bedroom with a day bed. This bedroom has private access to an updated hall bathroom. Upstairs, you will find the remaining two bedrooms. One room features a queen bed and the other offers two twin beds and a twin over twin bunk bed, perfect for a kids or teen room. They both have ensuite bathrooms and access to the sun deck. Outside, our guests will find a gas grill and an outdoor shower great for using after a day at the beach. The home is equipped with a washer, dryer, and high-speed wireless internet. Akers Ellis Resort was beyond beautiful, serene and welcoming upon our arrival. In the future I will book directly with them. I purchased this rental through and the resort was still very accommodating and the service and maintenance requests were performed for me promptly. The cabin was very spacious and every room has a bathroom. Beware though, there is some weird wiring issues. The cold on the shower runs hot and the hot runs cold. The light switches flip down to turn on and up to turn off. Little quirks that took time for us to figure out. My only complaint was the pollen and bugs. There is an open area that wasn't properly cleaned upon my arrival and tiny little bugs that I found, but not too many. This is to be expected when visiting and residing so close to nature I suppose. The kids have decided that this is the vacation spot to return too. I grew up on Amelia Island and we usually visit our family home there. This was a break from tradition that we may continue. Hey Taras, Thank you for this feedback. I apologize for any issues you experienced with the outside area upon your arrival. We will make sure we are doing a better job of addressing that moving forward. We will also look at the shower valves and correct whatever is needed. All of our properties are treated regularly by a professional pest control company so we will make sure they return for an extra visit. We're happy that you enjoyed your visit and would love to host you again in the future!